Microfusion Cells - what are they, where they come from, and where to find them. The Microfusion Cell is classified as ammo in each of the Fallout games: Fallout 1, Fallout 2, Fallout: Tactics, Fallout 3, and Fallout: New Vegas. It would have appeared in Van Buren too if that game had been completed. A miniaturized fusion reactor, the Microfusion Cell supplies power to a deadly variety of two-handed energy weapons, including the Plasma Rifle, the Turbo Plasma Rifle in Fallout 2 & 2, the YK42B Pulse Rifle in Fallout: Tactics, Harkness' Plasma Rifle in Fallout 3, and the YCS/186 Gauss Rifle in New Vegas. In Fallout: New Vegas, the Microfusion Cell was available in several unique variants: bulk, max charge, over charge, and optimized. The Bulk microfusion cells are of lesser quality, causing less damage. The Max Charge Microfusion Cell does the most damage to your enemy (X1.5), and to your weapon as well. The Overcharge Microfusion Cell does more damage to your enemy and to your weapon, but not as much as the Max Charge Cells. The Optimized Microfusion Cell provides a good balance between causing more damage to your enemy, but not as much damage to your weapon as the Max Charge and Overcharge Microfusion Cells. 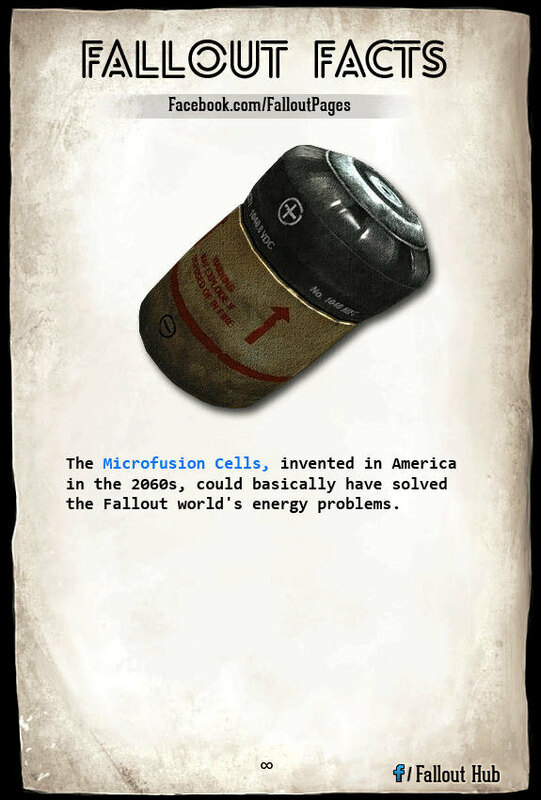 In Fallout: New Vegas, there is also an item in the miscellaneous inventory category called the “Drained Microfusion Cell”. With a sufficient Science skill (25) the player can combine four drained Microfusion Cells to create one fully charged Microfusion Cell; a great way to replenish your plasma rifle's ammunition in case of an emergency! The player may increase the efficiency of recycling drained Microfusion Cells with a higher Science Skill (50), and the Vigilant Recycler perk. This will make it so the player only needs three Drained Microfusion Cells to create a fully charged Microfusion Cell for ammo. That 1/4 reduction in supply cost can really add up, especially when surrounded by raiders. The Microfusion Cells were the only fuel source for the only drivable vehicle in Fallout 2, the Chryslus Motors Highwayman, which was the first drivable vehicle in the Fallout games. The vehicles in Fallout Tactics did not use microfusion cells (no one is sure what fuel they used to get those action points!). Buy microfusion cells in large quantities from Gloria Van Graff at the Silver Rush OR Blake from the Crimson Caravan Company (he sells them at higher levels). Where to find microfusion cells: large quantities can be found at REPCONN Headquarters, Quartermaster Bardon, and the Great Khan Armorer. And that's all we've got on Microfusion Cells. That's it for today, wastelanders! Stay tuned for more Fallout Facts coming up soon... Sooner than you think.